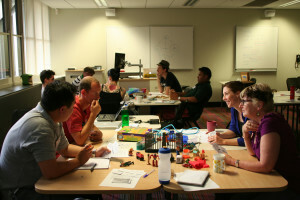 The workshop was very effective at teaching how to naturally incorporate a strategic, ethical approach to games making. Designed for teams or organisations who want to create a purposeful, educational or change-focused game and want to get the process jumpstarted. Individuals will learn the fundamentals of game design in the morning and in the afternoon they will apply what they’ve learnt. Working in small teams, participants will create paper prototypes (very early game mockups) of their games. The day concludes with discussion and professional feedback on the prototypes, voting on which one to move ahead with and a plan on how to take it forward.